Powers/Abilities: Hellbilly possessed superhuman strength and durability, and was a devastating hand-to-hand fighter. He wore hellfire-enhanced brass knuckles on his right fist, which he had dubbed his Penance Fist. He presumably could transform his chosen mode of transport into a burning vehicle capable of great speed. His shirt was adorned with pentagrams and other mystic sigils, and he wore a Sigil of Baphomet belt buckle; whether these had any special properties is unrevealed. 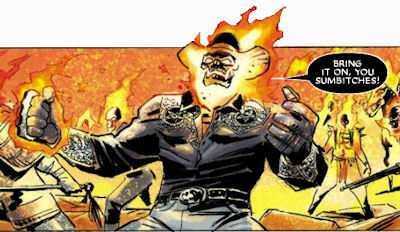 History: (Ghost Rider VI#33 (fb) - BTS) - Hellbilly was an Outlaw country Ghost Rider who operated in the late 1970s. He was a particular fan of Billy Joe Shaver. (Ghost Rider VI#33 (fb)) - In late 1970s Wilder, Kentucky, Hellbilly dealt with a zombie outbreak centered around Bobby Mackay's Music World (see Comments). Already annoyed that the zombies were killing and eating people, Hellbilly became livid when they broke the jukebox in the middle of playing Billy Joe Shaver's "Georgia on a Train." ( Ghost Rider: Heaven's on Fire#6) - Like all past Ghost Riders, Hellbilly was revived to take part in defending Heaven from the rogue angel Zadkiel. After defeating Zadkiel, the intimidating assemblage of Ghost Riders were among the first sights that greeted Kid Blackheart and his demon army as they stormed Heaven, hoping to take advantage of the damage Zadkiel had done to the angelic defenders. Though Kid Blackheart balked at the sight, his demons raced into combat against the Spirits of Vengeance, and Hellbilly greeted the chance to fight them with relish. After the demons were destroyed, Hellbilly met with Johnny Blaze, Molek and Knuckles O'Shaugnessy, and listened as Molek and Knuckles confirmed that Blackheart had escaped. Before they could discuss things further, Heaven lit up as God returned, and the resurrected Ghost Riders, including Hellbilly, returned to their eternal rest. 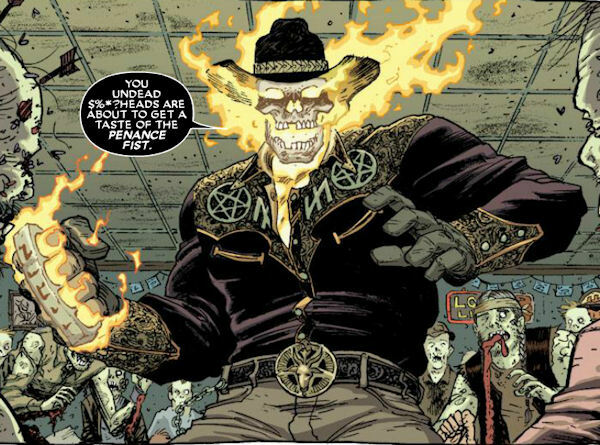 Like all the other Ghost Riders depicted in the flashbacks in Ghost Rider #33, there is limited information given about this character. Some online sites have dubbed him Penance Fist, but that's the name of his attack, and he is no more called that than Dan Ketch is called Penance Stare. The script confirms him to be the Hellbilly Ghost Rider and states that he is from the 1970s. 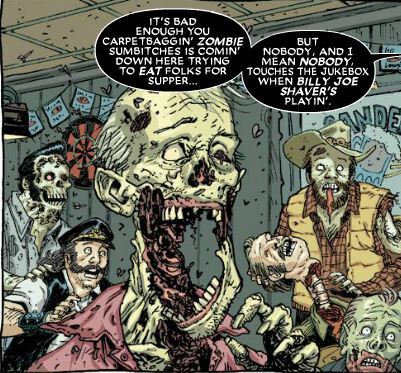 While the script called for his fight against the zombies to take place in a honky tonk bar, it didn't ask for a specific one, so presumably the choice of Bobby Mackey's Music World was artist Tony Moore's. Regardless of who chose it, it is an appropriate choice, as said establishment is the self-proclaimed most haunted nightclub in the United States, and urban legend says it stands over a gate to Hell. The sign outside the bar states "Saturday Night: Pearl Bryan and her Dentists from Hell"; since Pearl Bryan was a murder victim from 1896 whose ghost is said to haunt Bobby Mackey's, and since zombies chowing down on people could in some respects fit the description of dentists from Hell, this might conceivably refer to the zombie attack - in which case the undead Pearl Bryan should be considered one of Hellbilly's foes. Or maybe there actually was a real world band of that name. A small army of flesh-eating zombies attacked Bobby Mackey's Music World but proved to be no match for Hellbilly. Unlike some zombies, they were capable of running, and were strong enough in pairs to overturn cars. One of them resembled Elvis - whether this really was the King returned as one of the undead, or simply a zombie Elvis impersonator, was not revealed.